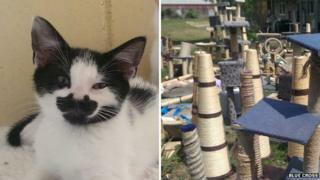 Dozens of abandoned cats living at a Cambridge rescue centre have lost their toys and scratching posts after they were destroyed by flooding. The Blue Cross charity centre had to throw out all 90 posts when they became saturated by drain water after torrential rain early on Friday. All the animals were safe, although 15 kittens had to be evacuated from the nursery which was covered in sludge. The centre has appealed for help to replace the posts and toys. There are currently 46 cats and kittens looking for new homes at the charity's Garlic Row centre, animal welfare assistant Claire Thomas said. The animals did not seem "too traumatised" by the torrential downpour or standing water in their pens, she said. However, staff were "gutted" when they saw the devastation caused by the overnight storm. The rescue centre was among a number of businesses and organisations in Cambridge affected by the overnight storm. Addenbrooke's Hospital in Cambridge was forced to declare a "major incident" and cancel all planned surgery until Tuesday after an area where sterilisation equipment is stored was flooded. The cat rescue centre has now been cleaned up and the destroyed posts, toys and blankets piled on the lawn. It would not be sanitary to dry them out, Miss Thomas added, so they will all need to be replaced. The Cambridge branch of charity Blue Cross cares for over 400 cats and kittens every year.